Machinery is everywhere in today’s world, and in a world so obsessed with technological and mechanical advancement a simple thing like a bolt is of utmost importance. Any machinery or technological device that one might use will have some form of bolt and screw mechanism which is holding the entire assembly in place. A bolt is a simply threaded fastener with an attached male thread. Bolts and screws work in tandem but can often be confused with each other. The main differential point is that bolts can assemble two un-threaded parts whereas screws require threads on both the parts and are used in components, which may cut their own threads. 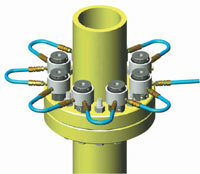 A bolt applies a tension on the components and uses clamps to hold the assembly in place. The bolted joint should always be designed in a manner in which the external forces acting on the bolt never exceed the tension. Bolt heads can be mainly two types, a hexagonal head type, and a square head type, the former being the more common one. Back in the early days of machinery and industrial revolution people use to fasten nuts and bolts by hand, this meant a lot of time and energy was expended in order to assemble one piece or even a component of machinery. As technology progressed industries still relied on human fastening for a very long time until in the early 1950s technological advancement helped with new tools designed entirely to help fasten nuts, bolts, and screws. These tools were both battery powered or required an energy source and were designed to spin at high speeds to fasten the bolts and nuts, and some tools were well calibrated to give an accurate amount of torque that aids in bolt tightening. In a recent development, a new type of fastening technique called bolt tensioning is now widely used in all critical applications. These devices apply a very accurate and specific tension to the bolt and hold them in place. Another type of nut bolt tightening machine is the hydraulic torque wrench; it is a sophisticated machine that applies a pre-determined amount of torque on a lubricated bolt or nut. The Pneumatic torque wrench is a bolt fastening tool which uses an air motor in tandem with a planetary gear to provide a noise-free and tidy bolt and nut fastening experience, it is also very fast and economically viable. There is various heavy duty pneumatic impact wrenches also available in the market which uses a lot of power and torque and is used in making ships, military vehicle, airplanes etc. In a heavy duty pneumatic wrench there can be three types of mechanisms, namely pin clutch, pin hammer and thin hammer, each of these provides a specific tightening purpose and can be used accordingly. With mechanical advancement and the upcoming rise in automation it is of little wonder that bolt fastening is very crucial and machinery will benefit from an improved design in tools and machines that fasten nuts and bolts, and with machines reducing in size tools too need to adapt to the change.